Since May of 1881, American Red Cross volunteers have been helping people prepare for the worst, assisting those affected by natural disasters and providing life-saving blood for patients in need. In honor of the heroes who perform these acts of selflessness each day, in 1943 President Franklin D. Roosevelt declared the first March is Red Cross Month, a tradition that has been carried on by each President of the United States since. 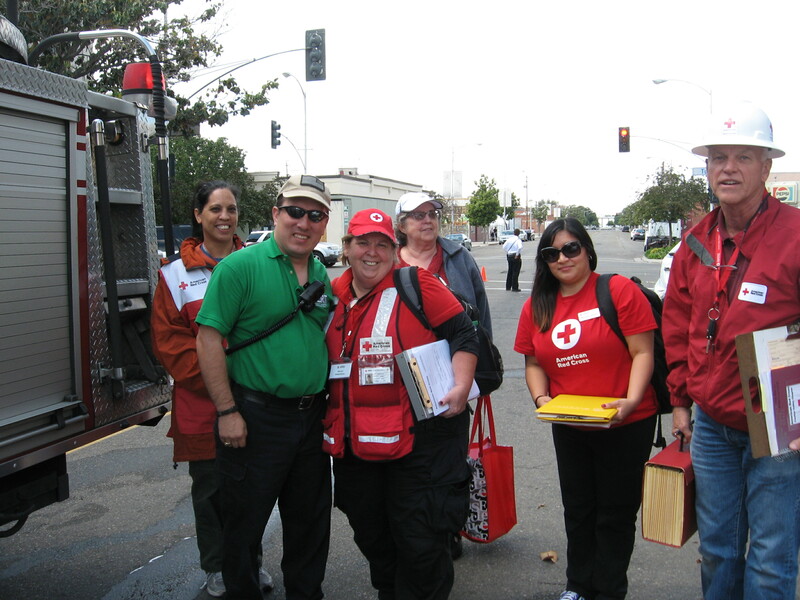 The Red Cross Central California Region has hundreds of volunteers in multiple counties. However, no person’s contribution to their community should go overlooked. That’s why during Red Cross Month the Red Cross is recognizing the country’s everyday heroes. Those heroes who help disaster victims get on the road to recovery, give blood to a patient in need, brighten the day of a service member who is far from home, and take lifesaving CPR/AED/First Aid classes in order to assist someone having a medical emergency. This willingness by people to donate their time and efforts to help others in need is what makes Red Cross such a special organization. During Red Cross month there are several ways to get involved in helping your community, whether you are a first time volunteer or a long time servant for your community. One way to get involved is through the Home Fire Campaign. In Fall 2014, the Red Cross set a goal to reduce fire deaths and injuries by 25% over the next five years. Since then, volunteers have spread out across neighborhoods to teach people about fire dangers and provide free smoke alarms to those in need, all in hopes of preventing tragedy. In March, volunteers will meet in Visalia (March 12th), Winton (March 19th), and Santa Barbara (March 19th) to install free smoke alarms and educate families on the importance of fire safety. You can sign up to volunteer for these one day events and help build stronger communities. Another way to get involved is through the donation of life-saving blood. This includes blood drives at Thousands Oaks Inn (March 7th), Moorpark College (March 8th), Oxnard College (March 8th), Rancho Santa Suzanna Community Center (March 11th), and Ventura City Hall (March 15th). Visit redcrossblood.org to find an upcoming drive near you. In San Luis Obispo, join the Red Cross along with Pacific Gas and Electric Company and El Dorado Broadcasting for the annual Preparedness Expo on March 12. Bring the family out for a day of fun and learning, so you’ll be ready for earthquakes, fires, zombies, and more! Friends of the Red Cross in the Santa Barbara area are invited to attend a Red Cross Month reception and happy hour at Benchmark Eatery on Wednesday, March 16 4:00 p.m. – 6:00 p.m. RSVP to kimberly.coley@redcross.org. Also keep an eye on State Street from March 11 through 18, as our traditional Red Cross banners will be waving proudly to mark the occasion. So join us in honoring everyday heroes like our Red Cross volunteers by celebrating Red Cross Month. Whether it’s through a random act of kindness, making a donation, or participating in volunteer opportunities, take a moment with us this March to celebrate this important work. For more information on upcoming Red Cross Central California events visit and how to get involved in American Red Cross month, visit redcross.org/centralcalifornia. 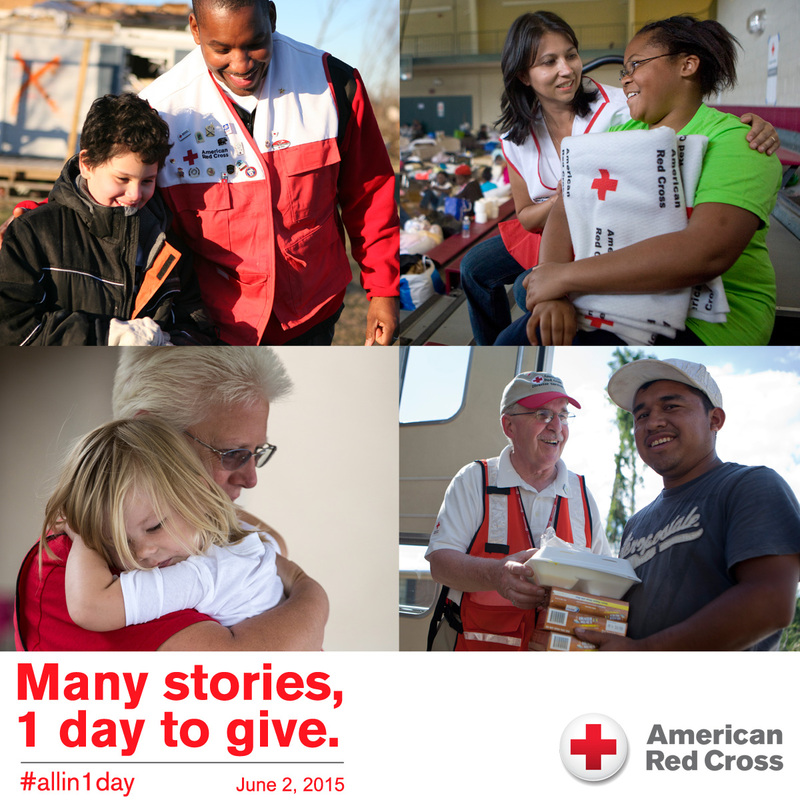 American Red Cross Giving Day kicked off early this morning and we’re asking everyone: Are you all in? The local Red Cross works hard everyday throughout Central California. Whether it’s helping residents affected by home fire or getting a service member home to see their loved ones, the Red Cross is there to help. and trained almost 50,000 people in CPR, First Aid, AED, and other life-saving skills. So… are you all in? Day in the Life: Front Desk Squad, 3:00 p.m. – 5:00 p.m. The afternoon sun was beating down on the asphalt as Heather McDowell walked across the parking lot towards the Camarillo Red Cross office. She entered the building and was greeted warmly by the volunteer in the reception area. It was time for a shift change, and it was Heather’s turn to assist at the front desk. Many people know Red Cross volunteers for their disaster relief efforts, but may not realize the thousands of volunteer hours that are put in every year behind the scenes. Front desk volunteers play an integral role in the day to day operations at local Red Cross offices around the world. Heather joined her volunteer colleague behind the front desk and got the run down the office happenings for the day: expected visitors, current local disasters, and any new administrative tasks that need to be completed. Heather has cared for people her entire life, working as a Certified Nursing Assistant (CNA) for the elderly with cognitive memory problems. “After retiring, I had a strong desire to help individuals in need during crisis situations,” said Heather. Just then the phone rang; Heather picked it up and warmly greeted the caller. It was an elderly woman who had lost her home in a fire and was looking for assistance. Heather instantly made the caller her top priority, offering words of comfort, collecting resources and contacts to make the woman’s recovery plan as easy as possible. Volunteers like Heather McDowell are part of the more than 90% volunteer workforce that provides humanitarian services in the Central California Region. The Red Cross thanks and honors these selfless and compassionate every day heroes during National Volunteer Week, April 12 – 18. Click here to learn more about the “Day in the Life of a Volunteer” series. Day in the Life: Volunteer Services, 12:00 p.m. – 2:00 p.m. It was about lunchtime when Jamie Winters walked in the Fresno Red Cross office. As usual, there was a flurry of activity and excitement in the air as volunteers and employees were prepping for a weekend full of fundraising and preparedness events throughout the chapter. Jamie plays an important but often behind the scenes role in her local office. With over 90% of the Red Cross workforce ran by volunteers, an intricate database is needed to manage information like training, communications, and volunteer opportunities. Volunteer Intake Specialists like Jamie work with volunteers from the day they express interest in signing up all the way through their training and beyond. On this day Jamie was helping to prepare for an upcoming volunteer orientation. Jamie made it to her cubicle and started up the computer. She checked her email and answered some volunteer questions before logging into Volunteer Connection to access the sign up list for the orientation. The list showed a wide range of new volunteers: from youth volunteers to retirees, part-time students to full-time workers, corporate executives to custom service associates. Jamie printed off her sign in sheet, collected the freshly printed volunteer manuals, and headed to the classroom for her orientation. Volunteers like Jamie Winters play a large role in Red Cross efforts to provide humanitarian service in the Central California Region. 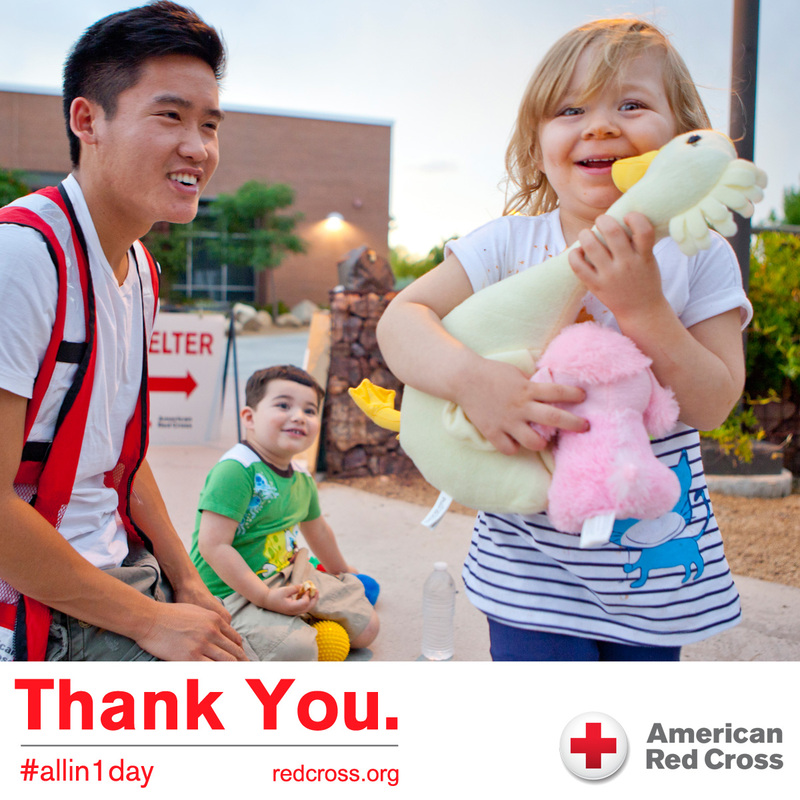 The Red Cross thanks and honors these selfless and compassionate every day heroes during National Volunteer Week, April 12 – 18. Click here to learn more about the “Day in the Life of a Volunteer” series. 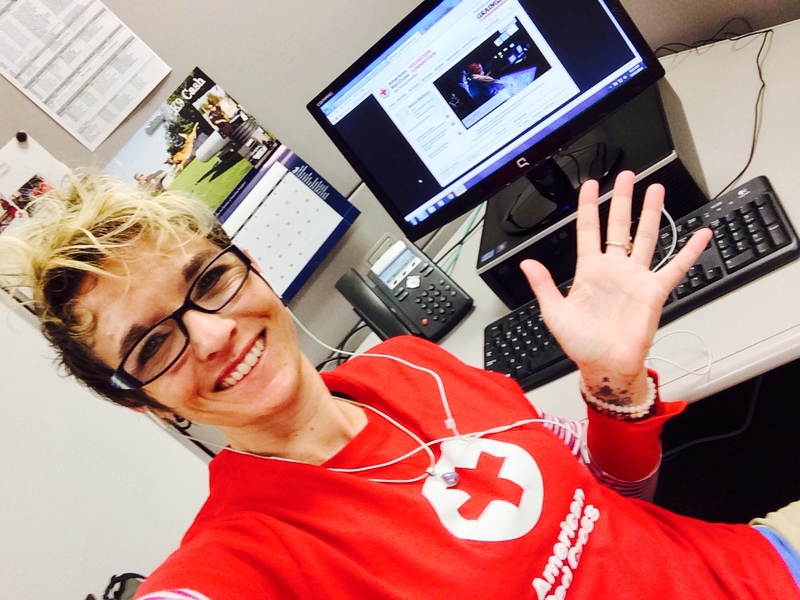 Welcome to the new Red Cross Central California Region Blog! We’re excited to begin this new adventure as a way to showcase the great work of our Red Cross team right here in Central California. You can look forward to stories, news, tips, and more from Red Crossers throughout or new ten county region. Submissions from volunteers, employees, clients and partners are encouraged, so if you have an idea for a blog, just let us know! It’s no coincidence that we’re launching this blog during National Volunteer Week. Starting tomorrow, we’re sharing a series of stories to recognize different volunteers in our region who work every day to make Central California a safer and more resilient community. “A Day in the Life of a Volunteer” will showcase the different roles that volunteers play during a typical day with the Red Cross. From early morning disaster responses to fundraising and everything in between, volunteers make up well over 90% of the Red Cross workforce. The volunteers featured in this series are real and their stories are based on true events. We hope it will give readers an inside glimpse at the day in a life of a volunteer, and inspire others to find ways to improve their own communities. Make sure to enter your email address on this page and hit “follow” to get these amazing stories sent right to your inbox. Also take a moment to visit our Central California Instagram account for extra content that you won’t see anywhere else! We look forward to sharing our Red Cross stories with you, and hope that you’ll join us on this blogging adventure!